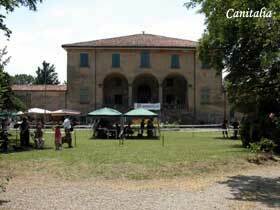 The last Amici Bassotto Club Klubsieger took place at Villa Beatrice in Argelato (Bologna), on June 18th, 2005. This customary annual event is particularly longed for the awards of the Italian Klubsieger Champions and the Young Italian Klubsieger Champions, as well as for the prestigious Rio Negri Challange and Giuliana Feri Challange, awarded to the Best in Show of the Day (BIS) and to the Best Young of the Day. 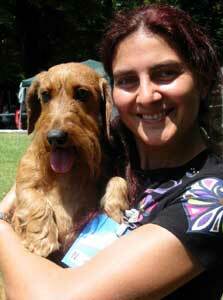 Both prizes are given in memory of the two great breeders, Mrs. Giuliana Feri and Mr. Rio Negri, who really made a very important part of the history of Italian Dachshunds, and who recently died. A long and wooded alley, on this occasion used as a car park, led people to an historical and wonderful villa, partly restored and surrounded by vast gardens; in its chilly cellars, with vaulted roof, was possible to taste the delights of the traditional regional cuisine. This event went on in a shiny day, certainly very hot, but suitable for the season we were. 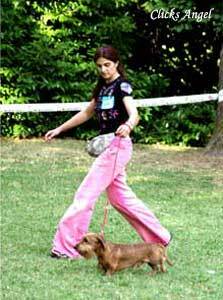 Besides Nova Food, the Club’s official sponsor who provided competitors with nourishing free samples, there were further stands belonging to professional dog-lovers, like the sculptor Cesare Rabitti, the painter Eva Marchewska, the Click Angel photographers, etc. This touch of “coloured” and artistic atmosphere is due to Delfino Rosa excellent organization, personally cared by Gabriella Russo. Considering the delay of numerous exhibitors, caused by heavy traffic on the motorway and in agreement with judges, the kind and professional E.N.C.I. representative Mrs. Manola Poggesi decided to postpone one hour the beginning of the competition. The presence of Italian and foreign Dachshund-lovers (once again, we were pleased to enumerate high-quality subjects from France, Germany and Czech Republic) has been so large to exceed all expectation, even better than previous years and enough to catalogue 230 subjects, shared out among all classes, including puppies, juniors, veteran, and all coats too. Summing up: 32 Smooth-Haired Standard, 7 Long-Haired Standard and 48 Wire-Haired Standard; 39 Smooth-Haired Miniature, 13 Long-Haired Miniature and 50 Wire-Haired Miniature; 22 Smooth-Haired Kaninchen, 3 Long-Haired Kaninchen and 16 Wire-Haired Kaninchen. Four rings were set up for the jury. Italian judges were represented by Mrs. Candida Pialorsi Falsina, Amici Bassotto Club Honorary President, breeder and referring judge for every Dachshund-lover and Mr. Luigi Guidobono Cavalchini, President of E.N.C.I. Central Technical Committee, veterinary and well-known breeder, that has recently got the extension to our breed. German judges were represented by Mrs. Martina Schneider, young and expert German judge, and the “veteran” Wilfried Petersen, President of the German Technical Committee, who were supported by the irreplaceable translators Mrs. Beatrice Brandt and Mrs. Rosemarie Villa. Such a competent jury granted a careful selection of subjects and the relevant final results were largely appreciated. 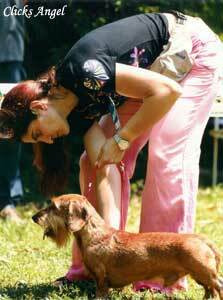 Every Dachshund was properly inspected, as it should be ever done, in its teeth (number and bite), tail (in order to exclude every possible imperfection), appendix xifoidea, in size (remember: up to 30 cm. thoracic circumference in case of Kaninchen and between 30/35 for Miniature; Standard’s weight doesn’t have to exceed 9 kg.) and temper (approach the judge, the ring and the “adversaries”). Every subject was carefully and seriously analysed as described above, then, once verified the absence of defect preventing from the qualification, the final result was stated considering resemblances to the standard and aesthetic qualities. At this time, every judge is allowed to express his own preference, maybe based on specific qualities appreciated at that very moment, that is: Wire-Haired quality, supported by thick defences in beautiful coats, sizes close to 9 kg. in Standard, right-angled fore-shoulders, fore and hind plumb-lines, well-balanced relation between skull and facial bones, right expression, etc. Third place: Heidi di Villahermosa, Kennel di Villahermosa's Smooth-Haired Standard. The best Young Italian Klubsieger chosen by Martina Schneider is Fantasticava dell’Antica Fortezza, the Smooth-Haired Kaninchen belonging to Claudio Montefusco.As a secretary of Amici Bassotto Club I would like to thank all the attendings and their Dachshunds, especially for their prompt and enthusiastic availability for every event planned by the Club. We thank so much for the unforgettable photos Sara Bello for Clicks Angel, Eva Marchewska and Sandro Arnetoli for Canitalia.